For other uses, see Württemberg (disambiguation). Württemberg (/ˈvɜːrtəmbɜːrɡ/, German: [ˈvʏɐ̯tm̩bɛɐ̯k]) is a historical German territory roughly corresponding to the cultural and linguistic region of Swabia. Together with Baden and Hohenzollern, two other historical territories, it now forms the Federal State of Baden-Württemberg. 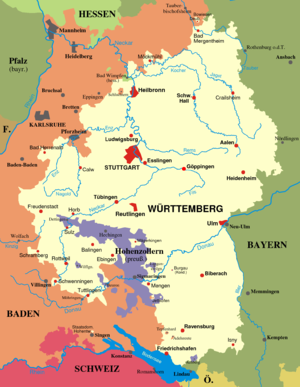 Württemberg was formerly also spelled Würtemberg and Wirtemberg. After World War II, it was split into Württemberg-Baden and Württemberg-Hohenzollern. Finally, in 1952, it was integrated into Baden-Württemberg. Stuttgart, the historical capital city of Württemberg, became the capital of the present state. Wikimedia Commons has media related to Württemberg. Württemberg in German, French and Italian in the online Historical Dictionary of Switzerland.